Explosion protection company Pyroban has modified a remote controlled Valla crane, so that it can be used in maintenance operations at a UK refinery, without being the source of ignition in a potentially explosive atmosphere. 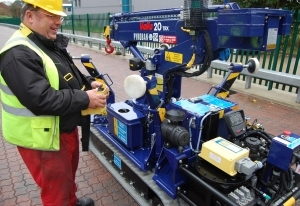 The Valla TRX 20D is a 2 tonne pick and carry crane which operates on rubber tracks with a speed of 2km/h. As a standard machine, it has many potential sources of ignition, which led the supplier, Valla Cranes UK, to contact Pyroban for an explosion proof solution. Controlled through wireless remote, the highly compact Valla crane lifts up to 2 tonnes and has a horizontal reach of almost 3m and height of almost 4.5m with a 3 stage boom. Weighing less than 2 tonnes, the crane is intended to be very compact which proved to be a challenge for Pyroban. In order to make mobile equipment explosion proof, Pyroban has to complete a full mechanical and electrical assessment to determine potential ignition sources including a full thermal test. The engine, motors, switches and many other components may then have to be modified using various explosion proof technologies. “In this case, the Valla Crane is powered by a small Kubota D722 diesel engine, testament to Japanese miniaturization and perfect for compact vehicles. However, there was limited space for us to make significant modifications to the engine and other components, which was an interesting challenge,” explains Rob Vesty. Pyroban engineers have to reduce all temperatures below a specified heat to prevent auto-ignition of a flammable hydrocarbon. On the engine, this means adding a water-cooled exhaust gas cooler to limit the surface temperature, which can be reasonably large. Following the pre-conversion testing, Pyroban Engineers developed an explosion proof solution for the complete crane. A kit of parts was then manufactured and issued to the Pyroban assembly line. Pyroban utilised their system 5000D solution which includes gas detection. On detection of a gas or vapour, a visual and audible alarm provides a warning followed by a complete shutdown of the equipment if dangerous levels are reached. The equipment is for use in a Zone 2 hazardous area where a flammable atmosphere is only likely for very short periods or as a result of a breakdown in process. This means that the crane operator will be made aware that there is gas or vapour present and any sources of ignition will be isolated immediately. Rigorous, post conversion tests on the crane conducted at full operating capacity, showed that temperatures of all components, including the engine, stayed within the specified T3 Class (200°C) and no other sources of ignition were present. The Valla TRX 20D is now ATEX 94/9/EC compliant and ready for safe maintenance operations within Zone 2 formally classified areas at a UK refinery.